As Dane Stout, Executive Director of the Connected Health Practice Practice at the Anson Group, succinctly put it, the primary strategy for making money on mobile devices as little as five years ago related to ringtones. Clearly, mobile technology–specifically the app ecosystem–has taken off since then and is being integrated into the daily workflow and lives of individuals at a rapid pace. When it comes to medicine, that means a great deal not only to healthcare providers but, more importantly, to patients. And this risk, as Dr. Wodajo pointed out in our previous series on the draft guidance, is precisely why the FDA got involved. Todays first session focused on defining “mobile medical apps.” As we discussed in our prior 3-part series on the FDA draft guidance, the definition largely centers around the intended use of the app. If the app use fits into certain criteria, then the app becomes subject to existing device regulations.As such, the definition determines the regulatory requirements and burdens that will ultimately fall on the apps and developers. And judging by the comments raised by the panel discussing this issue, there remains a fair amount of controversy around this critical part of the regulatory puzzle. 1. Risk, in addition to intended use, is an important consideration to developing a framework for regulating mobile medical apps. Accoring Grant Elliot, COO/CISO of Voxiva, the definition should consider risk as well as potential benefit. 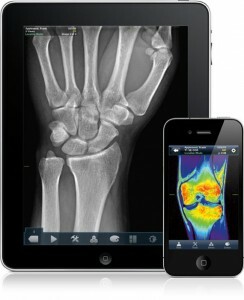 The pace of innovation in mobile medical apps is blistering but so are the challenges facing patients. He points out that 35% of Americans are in the pre-diabetes stage and as such the needs for innovative new approaches is quite pressing. As the market grows and increasing investments are made, fear ofregulation may slow the rate of growth. David Eischer, Managing Member of the Psilos Group, adds that in addition to patient and population health management, there are emerging mobile platforms for protecting patient safety. He describes a platform that utilizes an iPod Touch which uses a peripheral bar code reader which assists in matching a blood product to an individual patient. Current FDA guidance suggests regulation as a Class II medical device, requiring a 510k application prior to going to market. He (somewhat tongue in cheek) asks how this is any different than a nurse doing a visual verification and whether the FDA would similarly suggest that the nurse’s eye-glasses be regulated as a Class II device. The general feeling of the panelists seems to be that rather than regulating based on intended use, perhaps a better approach would be focus more on the risk posed by the app or class of apps. Kerry McDermott, Senior Policy Director of the West Wireless Health Institute, adds that when the discussion regarding the current FDA guidance began, the guiding principle was “intended use” but since release of the actual guidance draft, risk assessment may be a better principle to follow. For example, when it comes to diabetes apps, many of which are generally low risk with potentially high reward, it may ultimately be better to allow the market to determine which apps survive and which apps fail. 2. A significant amount of confusion centers around where regulatory borders lie as mobile medical apps interact with an EHR and networks. Leslie Hall, a Senior Vice President at Healthwise, pointed out one important consideration and possible deficiency in the current definition. It is missing a critical layer – interoperability. It will be important to consider how mobile apps interact with other devices. For example, a vital signs monitor which sends an alarm through a mobile app that acts as an information conduit or offers an additional layer of processing like triggering a specific action. This does not necessarily mean that an additional layer of regulation needs to be added, but rather that standards should be established. She later added that if the FDA tried to regulate the intrinsic features of a mobile device like a medical device (e.g. the microphone on an iPhone), the potential impact on the device as a consumer product would be uncertain. The “800-lbs gorrilla”, as Kerry McDermott puts it, is liability. Take for example Legos – the pieces are all interoperable but interoperability does not guarantee stability. So the question then becomes who is liable when the pieces fall apart and harm occurs. Ms. Hall argues it falls to the end user as no regulator, safety body, or other entity can imagine the millions of different modular pieces of a system (including mobile medical apps). However, the number of shaking heads (including some on the panel) seems to suggest that this opinion is not necessarily universal. One interesting trend among the comments shared seemed to hint that despite several clear exclusions from regulation in the FDA guidance, there is a significant amount of uncertainty about the future scope of regulation and the impact on the nascent industry. To view part 2 of our coverage, please click here.